← If you cook nothing else this August, then cook this….. Sadly I’m not going to be at Penshurst Farmers Market this weekend as I’m heading north to Harrogate for the WI Centenary Fair to do a cookery demonstration on Sunday from my The WI Cookbook: The First 100 Years. It’s a busy month for The WI centenary celebrations as the first ever WI opened in Wales in September 1915 and there are lots of special events happening this month to coincide. I’m having a lot of fun talking about my lovely book to various WI’s and groups across the country. And either next Sunday 6th or the following one (13th) you will find me cooking a selection of old WI recipes that didn’t make it into the book for John Craven on BBC Countryfile. You’ll have to watch to find out just why they didn’t make the grade and earn their place in the book – John and I found at least one of them rather challenging to eat! But read on to find out what I’ll be buying and cooking from other local markets when I get back home next week. 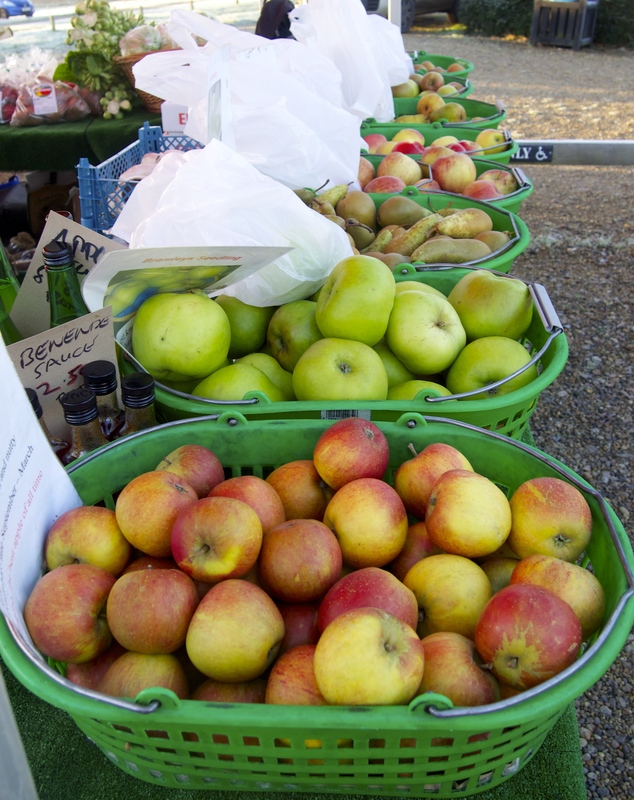 If there’s really a time not to miss a visit to your local Farmer’s Market then September must be the month. All the promise of the summer’s long growing season is now delivering (and despite the rain in August it’s looking like a cracking harvest), and it’s the time to enjoy an abundance of wonderful seafood, locally sourced game, a cornucopia of vegetables and here in the Garden of England, all the finest apples and dessert pears for which this area is justly famous. You can still find the end of the summer berries but also the richer-hued autumn fruit, such as plums and gages, are also ready for turning into jams, chutneys and puds, or just enjoying as they are. Remember good quality fresh produce from the market freezes really well and retain its goodness and food value so stock up for later in the year when ingredients are not so plentiful. 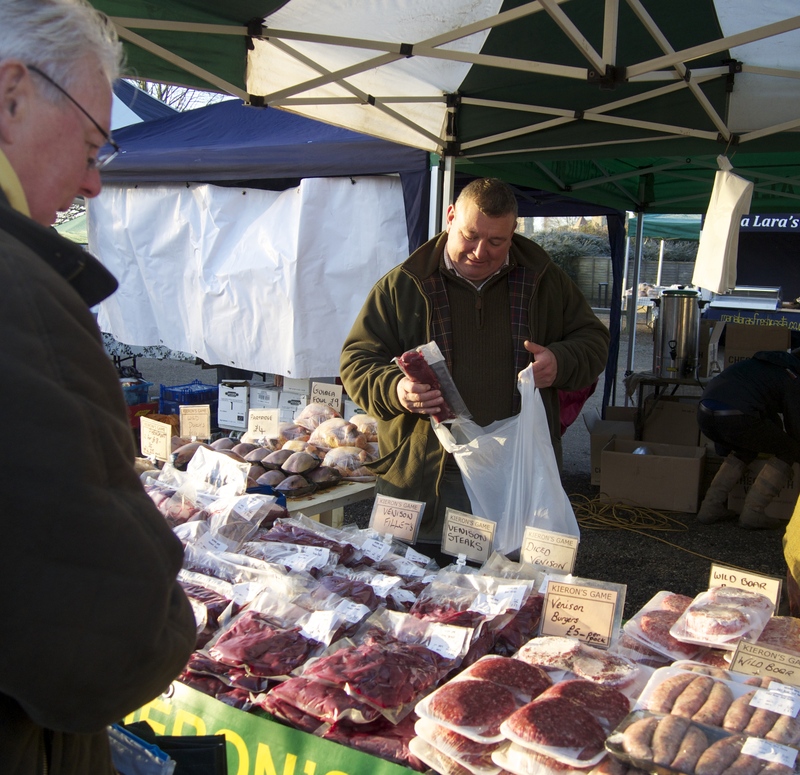 Keiron’s game at Penshurst So local it probably walked through the market last week! The changing season, shorter days and the return to school prompt a longing for richer more satisfying dishes – in fact my cottage is so cold after last week’s rain that I’ve been having open fires at night. This year make a vow to add game to your regular shopping list, particularly venison. It’s the perfect free-range meat – minimum food miles, low in cholesterol and full of useful vitamins. You can find both farmed and wild easily available, and modern game is no longer the tough, strong meat that needs long cooking that was familiar to our grandmothers. Lean and tender, it suits short cooking methods such as frying and grilling. Look for recipes on the internet as plenty of chefs are now using British game on a regular basis. Serve a venison steak flash fried with a thyme and mustard butter, or marinade boned pheasant breasts in olive oil, lemon, garlic and chilli and cook on a griddle. Vegetarians can go wild this month with the wealth of produce on offer (and try the curry recipe below). Tomatoes, courgettes, sweetcorn, peas, cauliflowers, runner beans, cabbages and onions are all plentiful and cheap right now, making this the month to try making your own chutneys and pickles. You don’t have to make huge amounts – just a jar or two can be very satisfying and you might just get the bug. Winter squashes and pumpkins are starting to arrive and come in an amazing array of shapes and sizes all with different flavours and textures – try in soups, curries, gratins and risottos (see the recipe below). If the weather turns wet look out for the appearance of wild mushrooms, and also search out local cobnuts and walnuts. Tree fruit are at their best and juiciest – apples and pears of course but don’t miss plums, damsons and greengages. They are wonderful for eating (not damsons! ), and using in preserves, ice creams, pies, and, if feeling very adventurous, even your own liqueurs and wines. (For recipes the Women’s Institute books are very reliable.) The blackberry season is also at its height – it’s a bumper year in the hedgerows, and you can find both cultivated and wild berries at the market for crumbles, jellies and jams. This curry is a wonderful way to welcome the autumn; it’s colourful, warming and full of goodness. I created it last year for a Waitrose feature and have been cooking it ever since ( it improves in flavour even more if made a day ahead). I really like using dried chickpeas as I think the texture is better but for a fast meal use canned. 1 Soak the chickpeas overnight in cold water. The next day, drain and place in a large pan with plenty of water to cover. Bring to the boil and simmer for 50 – 60 minutes until tender. Drain reserving the liquid. 2 Heat the oil in a large pan over medium-low heat. Add the onion, ginger, and garlic and cook for 2 – 3 minutes until soft. Add the spices and salt and cook for a minute. Add the squash and stir to coat in the spices. Stir in half the coriander, tomatoes and apples with 300ml water from the chickpeas. Bring to the boil, cover and simmer for 30 minutes until the squash is tender. 3 Add the drained chickpeas to the pan and simmer, uncovered, for 5 minutes. Stir the remaining coriander, chopped mint and lemon juice into the yogurt, season and swirl through the curry. 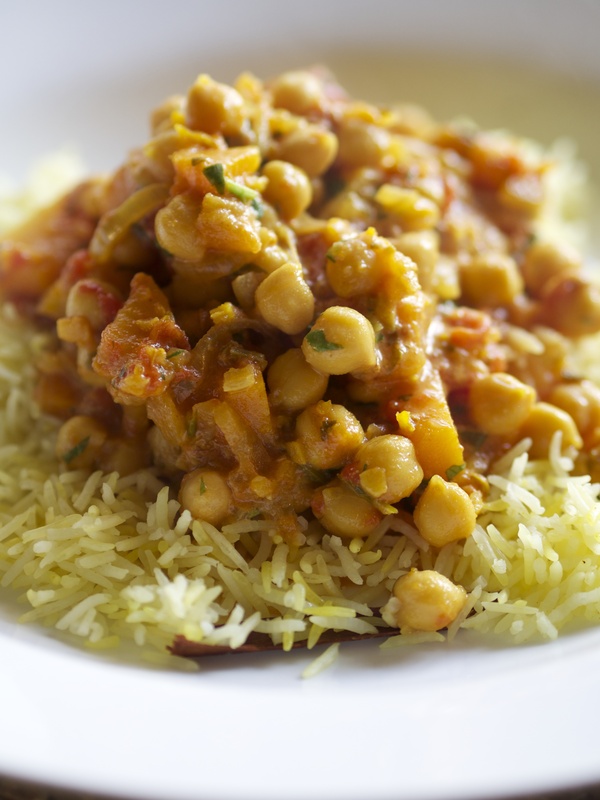 Serve with steamed brown basmati rice or a pilau. This entry was posted in Farmers Market, In season, Local food, Recipes, The WI and tagged BBC Countryfile, butternut squash, Chickpea curry recipe, farmers markets, in season, John Craven, Penshurst farmers market, Quick recipes, seasonal food, September food, The WI cookbook: The first 100 years, Vegetable curry. Bookmark the permalink.